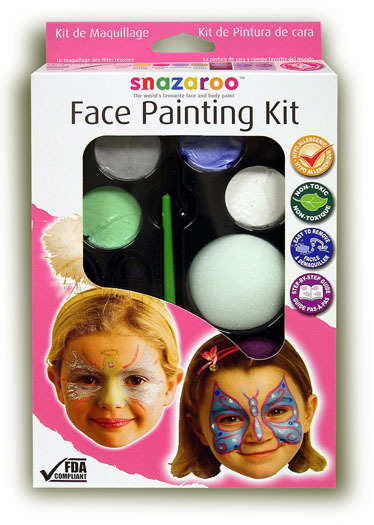 SNAZAROO is the World’s Favorite FACE and BODY PAINT. Suitable for KIDS and ADULTS. GREAT for PARTIES, PLAYS, FAIRS, HOLIDAYS and SPECIAL OCCASIONS. Paint Is Concentrated & Water-Based For Easy Application and Removal. Just One Application Is Needed for Fantastic Results. Safe - Non-Toxic - FDA Compliant. Paints are re-sealable and will keep for up to 18 months once opened. Easily create realistic looking cuts, wounds, warts, scars, scraped skin and more. Includes colorful step-by-step guide. Detail Brush, & Color Guide. Enough for up to 10 full faces. up to 10 full faces. Yellow, Lt. & Dk. Green. Enough for up to 50 faces. Snazaroo Face Painting Set with 8 CARNIVAL COLORS: Pastel Yellow & Green, Turquoise, Silver, Sparkle Blue and Lilac & White (2 ml ea.) with Sponge,Detail Brush,and Color Guide. Enough for 50 Faces. 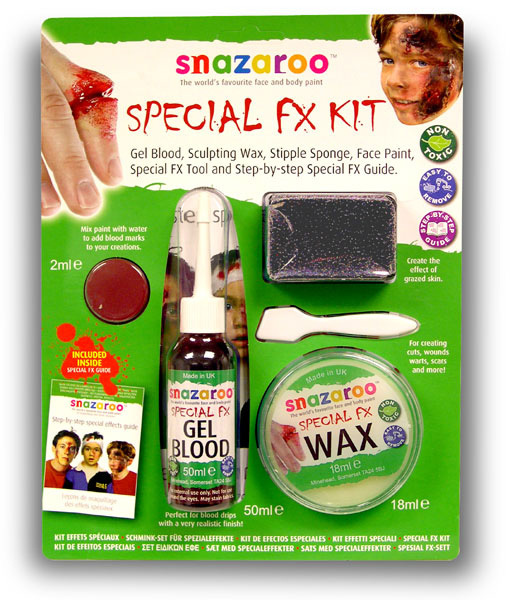 Snazaroo Special Effects Makeup Kit. Easily create realistic looking cuts, wounds, warts, scars, scraped skin and more. Includes colorful step-by-step guide. 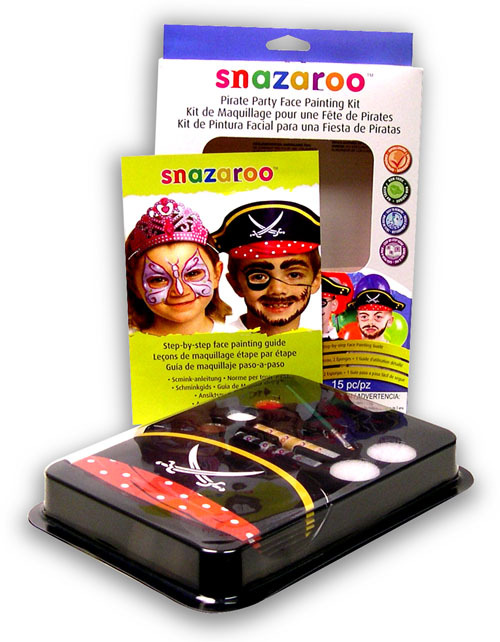 Snazaroo Face Painting Set PIRATE PARTY: Contains 6 Pirate Hats; Red, White & Lt. Brown Face Paint; Gold & Black Face Paint Sticks; 2 Sponges, Detail Brush, & Color Guide.Enough for up to 10 full faces. 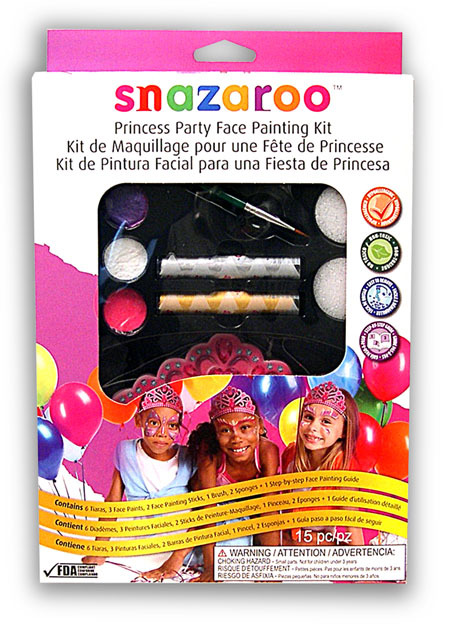 Snazaroo Face Painting Set PRINCESS PARTY Contains 6 Tiaras; Bright Pink, White & Sparkle Lilac Face Paint; Gold & Silver Face Paint Sticks; 2 Sponges, Detail Brush, & Color Guide. Enough for up to 10 full faces. 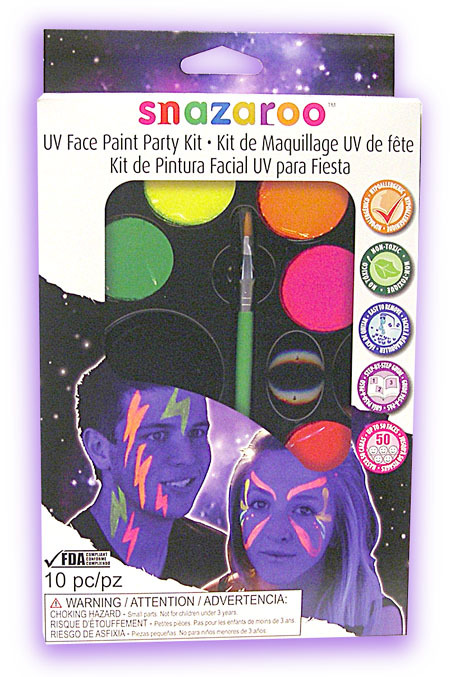 Snazaroo Face Painting Set UV FACE PARTY KIT. Has 8 UV Light-Activated Colors, Detail Brush & step-by-step Painting Guide. Colors are Pink, Dk. Red, Lt. Red, Dk. & Lt. Orange, Yellow, Lt. & Dk. Green. Enough for up to 50 faces.